Time Magazine's new issue reveals Ben Bernanke as the person of the year. I did some internet research to try and learn more about what it takes to be Time's person of the year, in an effort to understand what type of honor this actually is. In times past, influential individuals such as Dr. Martin Luther King Jr., Winston Churchill and Joseph Stalin have graced Time's cover under this particular topic. One of the things I learned during my light research was that this title is not an award and may not necessarily be an honor. Essentially it is bestowed upon the person, or thing, that has been most influential throughout the year and not always in a positive way. 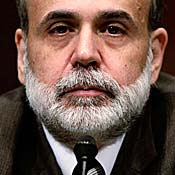 Ben Bernanke, for those that may not know, is the Chairman of the Federal Reserve Bank. He was appointed by G.W. Bush, during his presidency. One of the few choices Bush made that actually turned out to be a good one. As chairman of the Federal Reserve Bank, Bernanke controls, the flow of money, inflation, unemployment and the strengths of the dollar, among other things. Last year, when the economy began taking it's dramatic tumble downward, it was Bernanke's genius, which prevented this country from suffering a second Great Depression. His method was simple. Infuse more money into the economy. Allow banks to begin lending again, to keep the flow going. A methodology clearly embraced by the Obama Administration, by the stimulus dollars pumped into the economy. Bernanke wasn't perfect, however. There was and is clearly more he could've done regarding the availability of gainful employment in this country, which is my biggest criticism of him. However, had it not been for the steps he took to prevent a national crisis, we would certainly be in worst shape then we are now. So for that, I personally honor his intelligence and his courage. Bernanke was definitely the key player in the biggest topic of the year. I am interested in knowing what the Urban Politico community at large thinks of this gesture by Time.